Visually stunning and usually set to a beautiful backdrop, a holiday just isn’t a holiday without spending hours in or by a luxurious pool. Ancient civilisation was aware of this and today we also recognise that the best pools have captivating views and are surrounded by beautiful scenery. Today, our love of a quick dip has culminated in an assortment of spectacular swimming pools with amazing views. With more than 66 million gallons of crystal clear seawater, San Alfonso del Mar resort in Chile holds the record for the world’s largest outdoor pool. You would need to swim 20 Olympic sized pools to swim just one length of this man-made lagoon and it is more than twice the length of the next biggest outdoor pool. Costing over $3 million it is so big that visitors can sail small boats or paddle kayaks around it. The San Alfonso is located beside the city of Algarrobo on a particularly scenic part of the Chilean coastline and boasts panoramic views of the Pacific Ocean. Officially the world’s most expensive building in history, the Marina Bay Sands Hotel in Singapore is the ultimate in luxury. With a whopping price tag of $5.7 billion and the best architectural design money can buy they certainly did not skimp when it came to the pool. In the renowned Skypark you can sample decadent cocktails whilst enjoying some of the best views of the Singapore skyline available from a mind-boggling 150m infinity pool. At night this magnificent skyline lights up in a hive of glittering activity. The Maldives is the ultimate in luxury and the infinity pool at the One & Only Resort Reethi Rah oozes class. It is over 30 metres long and extends into the heart of the stunning azure lagoon that surrounds this island. The views are spectacular from any angle and the pool features a ‘bubble bed’ where guests can chill out and enjoy this laid back part of the world. The Katikies Hotel in Santorini is built with the iconic architecture of the Greek islands. Whitewashed walls and staircases are perched on the Santorini cliffs with an exceptional view of the volcanic caldera and Aegean Sea. This is one of the most beautiful archipelagos in the world and the architects knew this when they were constructing the pool. The beautiful infinity pool lies on an open-air sunbathing deck that overlooks this majestic view and is coupled with an outdoor jacuzzi for those looking for relaxation. 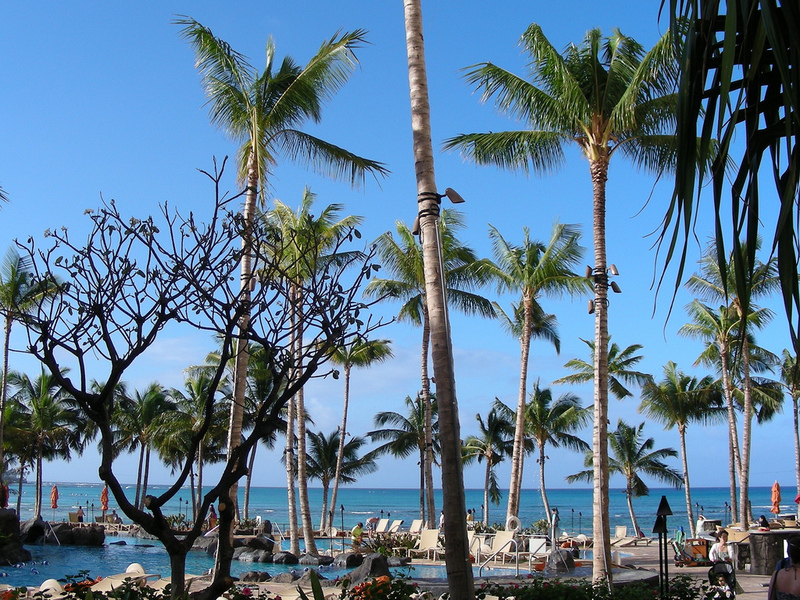 On the famous Waikiki beach on the Hawaiian island of Oahu there are a great number of hotel options to choose from. Truly though, if you are looking for traditional Hawaiian hospitality with a bit of style and substance behind it, the Sheraton should be your first point of call. Palm trees and sunbeds surround the lagoon-like pool with staff waiting on your every beck and call. If that isn’t enough then the optical illusion created by the infinity pool should do it. The Joule Hotel was once the Dallas National Bank until it was bought and converted into a luxurious city hotel. One of the additions during these renovations was a stunning pool extruding from one of the hotel balconies. From here you can get a spectacular view of the Dallas city skyline and the glass front panel means the skyline can be seen from under the surface of the pool. A Sydney institution for over 80 years, the pool at the Bondi Icebergs club lies on Australia’s most famous beach, Bondi. Traditionally a lap pool, swimming is special here as you look across the beach, cliff and oceans. At the beginning of winter each year, the club holds a party where a giant ice cube is thrown into the pool to commemorate the hardness of Aussie swimmers. The water might be chilly, but the views more than make up for it. beautiful water , how they clean it ? Good question. They probably use the same cleaning machines similar to the ones they use at Olympic swimming pools. When I first went to Singapore and saw the building, I thought how did they fit that ship on top of those buildings?